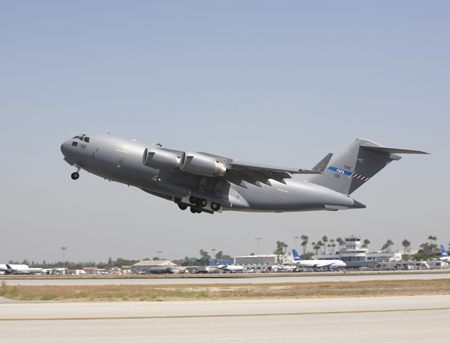 LONG BEACH, Calif., Sept. 17, 2009 -- The Boeing Company [NYSE: BA] today delivered to the NATO Airlift Management Organization (NAMO) a second C-17 Globemaster III that will support NAMO's 12-nation Strategic Airlift Capability (SAC) initiative. The delivery took place at Boeing's final assembly facility in Long Beach. "This effort symbolizes solidarity at its best -- 12 nations demonstrating what can be accomplished when they pool resources and goodwill to collectively serve those in need around the world," said Gunnar Borch, General Manager of the NATO Airlift Management Agency (NAMA), the executive body of NAMO. "This is on display here today in Long Beach and at Pápa Air Base in Hungary, where multinational forces are working side-by-side to support the SAC mission and one another." "Every day, on the flight line at Pápa Air Base, I have the privilege of seeing the men and women from the SAC nations serving together -- their teamwork on display, their sense of purpose clear, their commitment to serving those in need unwavering," said Col. Fredrik Héden, deputy wing commander, HAW. "The 12-nation mix of NATO and Partnership for Peace nations found it possible to work together to make SAC a reality, and because of that we are now prepared to meet today's humanitarian needs and security challenges." A Boeing team based at Pápa provides support for the SAC C-17s, including material management and depot maintenance support, under Boeing Global Services & Support’s C-17 Globemaster III Sustainment Partnership.